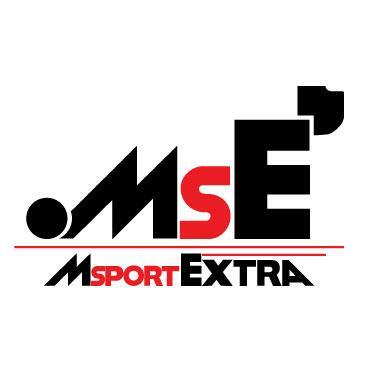 Barcelona is often the place to bring plenty of new bits as not only is Spain closer to home for most teams, but it’s important to start the European leg of the season with additional performance. So it is quite a surprise to see so many new parts turn up in China, just before the Spanish GP in two weeks’ time, although we could perhaps see some more comprehensive updates for Europe. The Shanghai International Circuit is one of the ultimate compromise tracks: straight-line speed versus down force. 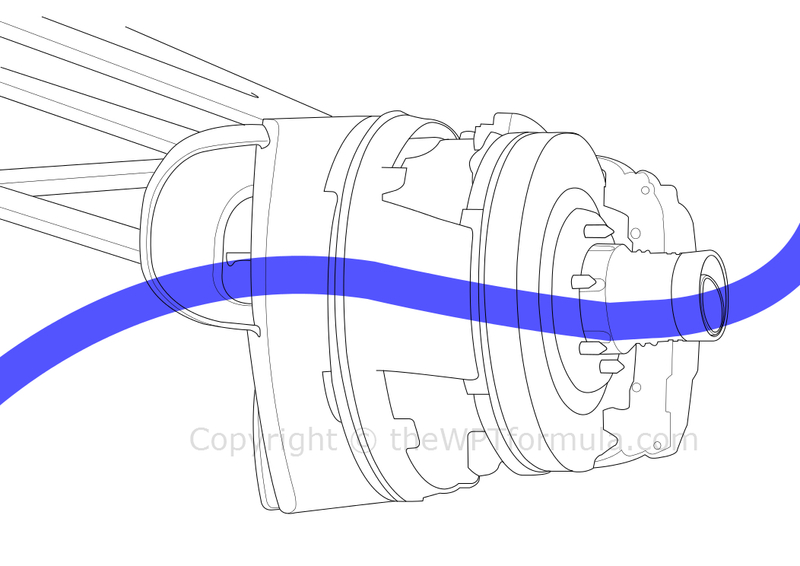 It is therefore important to bring parts that will still gain time in the corners but work efficiently to conquer drag down one of the longest straights in F1. It was interesting to note just how much time the Red Bulls were able to claw back in the middle sector relative to the Mercedes cars, only to lose this slight advantage in the third sector containing the aforementioned straight. With Renault bringing further software improvements to their ERS, Red Bull looked a little closer to the Mercedes in terms of outright pace. Fundamentally the Renault power unit isn’t bad although it is probably a touch behind in the hardware department which, unfortunately, they cannot change. However their ERS has always been plagued with issues so it is only a matter of time until they fully maximise this area. To complement the additional power and driveability that Renault’s updates bring, Red Bull installed new low-drag front brake ducts. Unlike their predecessor, the two vortex inducing scrolls have been removed and a much cleaner, simplistic design has been utilised instead. Although this compromises the management of front tyre wake, there is less surface area for oncoming airflow to act upon which therefore reduces drag slightly. Vortices also produce drag so by removing the two scrolls further straightline speed has been added. A conventional way of keeping constant brake temperature is to place tape over the brake duct openings. This is a technique often used by McLaren as they can rip off the tape during a pitstop should the brakes need a bit more cooling. However Red Bull have implemented a more efficient solution by taping on carbon fibre pieces. This encourages air to pass around the duct openings, thus reducing drag a little further, whilst also maintaining constant brake temperature. After plenty of rumours, Mercedes finally brought their revised nose to China. First mooted when observers spotted that the nose in Mercedes’s advertising posters and short technical animation videos differed compared to the one on the W05 from the first test, AMuS delved deeper and discovered that the new design stumbled across a few problems along its development path – it was scheduled to arrive for Australia but ended up failing 4 crash tests. Based on its fundamental design from the first iteration, the nose tip forms an inverted ‘u’ shape centred around the required 185mm above the reference plane. However the team have made the ‘u’ larger which allows the height of the nose to be raised further, encouraging more airflow beneath the car. By regulation, there are still mounting pylons of the specified thickness that lie just beneath each side of the ‘u’ which are visibly narrower, as it was on the previous nose. The entire assembly has been shifted backwards to roughly the minimum distance allowed from the front wheel centreline as possible. The “stub” shape that this forms encourages the main plane/central section of the front wing to work a little harder, as previously the venturi effect that the old nose created was right above the neutral wing segment, causing low pressure both above and below the plane. Now that the venturi forms further backwards the main plane can function function in a more conventional manner which also positively impacts the rest of the wing’s performance. As tested in Bahrain two weeks ago, Ferrari continued to use (and race) their version of the blown wheelnut concept. This was first seen last year when Williams introduced it during testing only to drop it before Europe. The saga then continued with Red Bull who kept trialling it across the season. Now, in 2014, it’s back once more with Ferrari. The idea behind it is to manage front tyre wake by passing airflow through the brake duct openings on the inside of the wheel to the outer face of the wheel and out into the airflow passing around the front tyre. The blue line represents this effect. This air does not circulate through the drum and cool the brake, although there is a separate network of piping for air to do this conventional job. By projecting cleaner airflow into the firing line of airflow passing around the tyre, it discourages the formation of large vortices and general turbulence behind the tyre which can impinge on the leading edge of the floor and sidepods. It also has the added benefit of aiding the front wing push airflow around the front tyre, a more persistent problem due to the narrower front wings in 2014. We can see that Ferrari are using very large brake duct inlets which suggests that they are really force feeding the system to try to create cleaner airflow behind the front tyre. I have always said that the E22 has potential, and Lotus could finally be starting to dig beneath just the surface of their black and gold machine. Coupled with further improvements from Renault, Lotus have been ramping up aerodynamic development significantly of late and there were further updates for China. Copying Red Bull, the team introduced almost identical rear diffuser Vortex Generators (VGs) to encourage airflow to remain attached to the central section and induce a little more rear downforce. Previously the starter motor hole opening did a good job at doing this but now that the regulations have been tightened up in this area teams have to find other ways of extracting the best from the diffuser. This was allied with some minor revisions to the front wing, including modified cascade winglets. 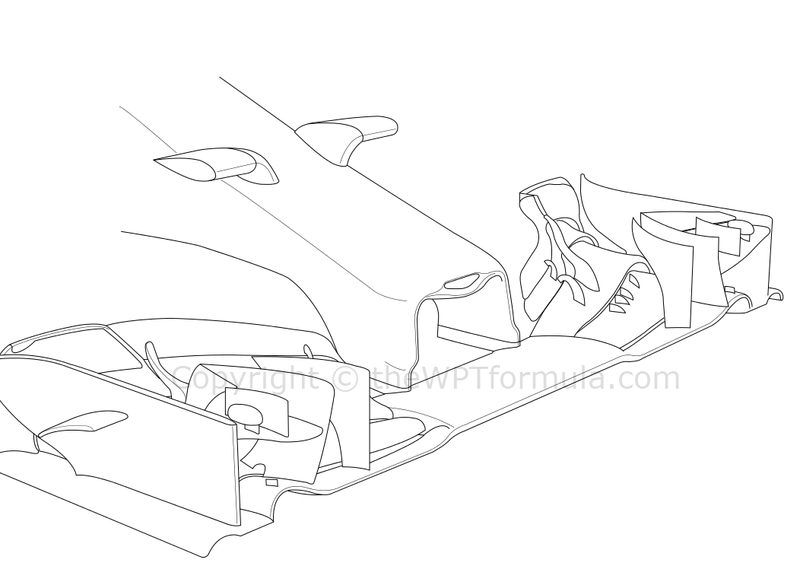 An additional vane was added to the front wing endplate (including a slot), both of which form pressure gradients (low pressure created beneath each profile) which aid in managing airflow around the front tyres. Both vanes feature slots along their length, suggesting that at certain speeds airflow can be bled through the vane to create an optimal pressure gradient across a larger air speed threshold, thus increasing the consistency of the devices. McLaren also developed number of software updates for their Mercedes power unit to improve driveability, i.e. the way the powertrain delivers torque. This update comes at a particularly important stage of the season as not only does China present a high chance of rain but also various rounds across the European leg of the season. Sampling this update early will give the team a chance to make further improvements before Spain. A new set of rear wing endplates was introduced for the post-Bahrain GP test and have subsequently made their way onto the car for China. They feature no more than 7 small vanes at the trailing edge that all curve upwards which, together with the rear brake ducts, induce an upwash effect at the rear of the car to extract more performance from the diffuser. Accompanying the vanes were new vortex reducing gills, now lying horizontal compared to a previously angled arrangement. Their aim is to reduce the size of the vortices formed at the wing tips and thus decrease drag (read more about this here). A slight revision to the sidepod airflow conditioners was also made, with the base of the device attached at an arc to the leading edge of the floor rather than vertically to a point slightly further back. This encourages airflow coming around the sidepod undercut to retain itself along the bodywork downstream which boosts efficiency. Another team to make minor revisions to their current package was Toro Rosso. This included and elongated appendage section to the nose with an aim to encourage more airflow to pass beneath the higher ‘m’ arc further back. A pair of slanted sidepod VGs were also added, keeping airflow attached over the bodywork and downstream towards the rear of the car. This reduces the boundary layer across the top of the sidepod (reducing drag) and also increases the potential of the diffuser by feeding the top side of the floor with more air. 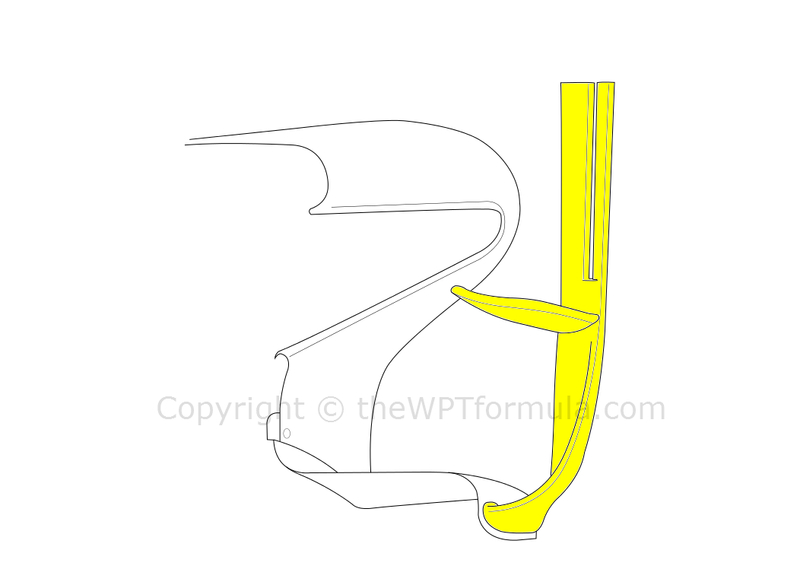 This entry was posted in 2014 Highlights, Technical Highlights and tagged 29, analysis, bull, china, e22, f1, lotus, mclaren, mercedes, mp4, new, nose, rb10, red, rosso, technical, toro, w05 on April 20, 2014 by thewptformula. Interesting stuff. Ferrari really seem to have improved (well, with Alonso at least). MInor point: isn’t it three weeks to Spain? Fantastic blogpost. Might you send me to some more of your posts. Have you got any advice on establishing a blog site? of thing at the office and would like something mroe challenging. It depends what you want to blog about. I’d been considering it for some time then one day I just went ahead and set it up! Keep posting regularly and make yourself visible elsewhere (comments on forums, social media, feature pieces etc.) and you’ll get a wider audience who will be interested in what you do! One thing I would say is that whilst posting regularly is important, I wouldn’t post something I didn’t want to talk about i.e. unnecessary posts. There might be times when you might think that you haven’t written in a while and you ought to post but I honestly wouldn’t unless you want to, because then that desire to write is translated to the reader.